Mostly cloudy early, then sunshine for the afternoon. High 58F. Winds WNW at 10 to 20 mph..
Dorothy Regina Jane Strobel Ferrando died in her home among family members on Friday, June 1, 2018, in Pasadena, Texas. Dorothy was born on Oct. 19, 1926, in Tell City, Indiana, a town "on the banks of the mighty Ohio River" as she liked to say, the second of eight children, to Catherine (Eberle) and Henry A. Strobel. She attended school in Tell City, was the spelling champion of Perry County, and graduated as valedictorian from Tell City High School in 1944. A tireless worker, she was employed by the A&P grocery store in Tell City and at the General Electric factory assembling radio tubes while still in high school, during World War II. Dorothy earned a scholarship in nursing and moved to Evansville, Indiana and became a registered nurse. Always adventuresome, she earned another scholarship in nursing at Carroll College in Helena, Montana. She travelled across the country from Tell City to Helena, a daring endeavor for a young woman in the 1940's. While studying at Carrol College, she met a WWII Navy veteran and native of Red Lodge, Montana, in a biology class, Dominic M. Ferrando. The two began dating and fell in love, and were married on June 10, 1950, at St. Paul's Catholic Church in Tell City. The couple relocated to Omaha, Nebraska, where Dorothy worked full time as a nurse, and Dominic completed his studies at Creighton University's School of Medicine. The couple eventually settled in Butte, Montana, where Dominic practiced anesthesiology, and Dorothy managed the business. She was an avid bridge player, gardener, very active in the St. Patrick's and the Immaculate Conception Church home and school associations, The Butte Community Concert, and the Homer Club. Bridge remained a passion throughout her entire life. She also enjoyed fishing on the Big Hole River and Georgetown Lake on summer evenings with family, especially her grandchildren. Dominic passed away on Nov. 6, 2000, a few months after the couple had celebrated their 50th wedding anniversary. Dorothy relocated from Butte, to Pasadena, Texas, in 2001 to be with her grandchildren. Dorothy joined the faith community at St. Hyacinth Catholic Church, and was an active member in ministry and social groups. She also joined a bridge group in Pasadena and played weekly for many years. In her last years, Dorothy attended St. Clare of Assisi Catholic Church in Houston, and became a fixture at the Saturday Vigil Mass. We will always remember and appreciate Dorothy's grace and sense of humor, which never left her, even in illness. She was always a lady, and treated everyone she met with dignity and respect. Dorothy was preceded in death by her husband, Dominic M. Ferrando, M.D. ; her parents, Henry A. and Catherine Strobel; her sisters, Ann Wirthwein, and Frances O'Brien; brothers-in-law, Levinus Brockman and Jack Birchler; nephew, Mark Brockman; brother-in-law and sister-in-law, Frank H. and Petronella "Pat" Kelly; and nieces, Mary Kelly and Catherine Downing. 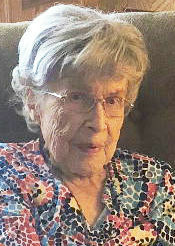 Dorothy is survived her son, Mike and wife, Debbie of Pasadena, Texas; grandchildren, Anna Ferrando of Fort Worth, Texas and Anthony Ferrando of Cedar Park, Texas; step-grandchildren, Britain Moore of Georgetown, Texas, Timothy Moore of San Antonio, Texas, Christopher Moore and Zachary Moore, both of Houston, Texas; sisters, Mary Birchler of Indianapolis, Indiana, Rita Brockman of St. Meinrad, Indiana, Carol (Don) Dauby and Paul (Ruth) Strobel of Tell City, Indiana, and Henry (Susan) Strobel of Aumsville, Oregon; and numerous nieces, nephews, and grand-nieces and grand-nephews. "We will miss your dedication to family; we relied on your strength and great compassion for others. We will miss your love, companionship and your wonderful sense of humor." Memorial Mass of Christian Burial will be celebrated at 10 a.m., Wednesday, June 6, at St. Clare of Assisi Catholic Church, 3131 El Dorado Blvd., Houston, Texas, 77059. Memorials can be made out to St. Hyacinth Catholic Church Capital Campaign, 2921 Center St., Deer Park, Texas, 77536 and St. Clare of Assisi Catholic Church Capital Campaign, 3131 El Dorado Blvd., Houston, Texas 77059.